HARLEM The owner of a Harlem liquor store broken into twice in a week says police took too long to respond, and failed to look at surveillance footage which showed the thieves until after they’d struck a second time. 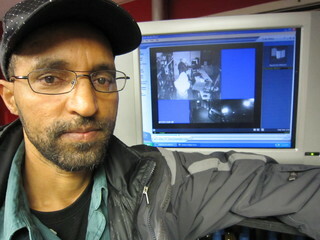 Berihu Mesfin, owner of Freeland Liquor & Wine at Lenox Avenue and 119th Street, said video footage shows police didn’t arrive at the store until 28 minutes after the second burglary on March 22. In addition, they did not come to pick up surveillance tapes from the first burglary on March 17 until March 24, two days after the second burglary. “What I see is carelessness from the police,” said Mesfin, who added that cops told him they were going to examine the footage the day before the second burglary. Burglars broke into Mesfin’s store in the Mount Morris Park Historic District by cutting see-through gates and drilling a hole in the lock at 1 a.m. On March 17. Video footage shows hooded men hopping the counter and stuffing their pockets with $4,000 in cash. INITIATORS: El Puente, National Congress for Puerto Rican Rights-NYC Chapter, DC 37/AFSCME-Local 372, Casa de Las Américas, July 26 Coalition, Cuba Solidarity New York, Wives Without Rights Campaign, Popular Education Project to Free the Cuban 5, ProLibertad Freedom Campaign, Latin America Democracy Committee, 1119/SEIU, and Occupy Harlem. On February 26, 2012, a 17-year-old African-American named Trayvon Martin was shot and killed in Sanford, Florida. The shooter was George Zimmerman, a 28-year-old white man. (Zimmerman was described by the police as white. According to his family he is also Hispanic.) Zimmerman admits killing Martin, but claims he was acting in self-defense. Weeks after Martin’s death, no arrest has been made and Zimmerman remains free. The Martin case had been turned over to the Seminole County State Attorney’s Office. The furor over the shooting of Florida teen Trayvon Martin is being exploited by the likes of Jesse Jackson and Al Sharpton to racially divide the country, a civil-rights leader charged yesterday. Martins family should be outraged at the fact that theyre using this child as the bait to inflame racial passions, the Rev. C.L. Bryant, a former NAACP leader, said of the 17-year-old hoodie-wearing black youth who was shot dead by a mixed white-Latino neighborhood-watch volunteer. The pastor accused Jackson and Sharpton who yesterday organized a thousands-strong protest in Sanford, Fla., where the shooting occurred last month of acting as though they are buzzards circling the carcass of this young boy in an interview with The Daily Caller, a news Web site. Bryant, the past president of the NAACP chapter in Garland, Texas, called Jackson and Sharpton race hustlers for inserting themselves into the drama.